In the ’80s, the city was living its glory days. 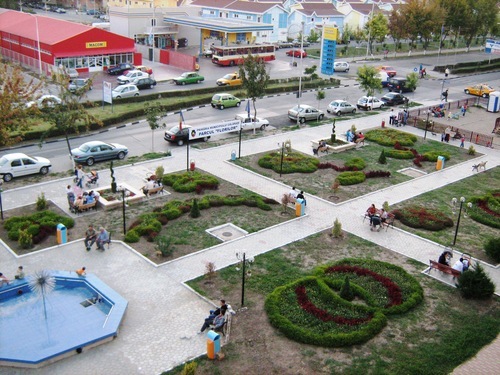 It also won a prize as “the cleanest city in the Socialist Republic of Romania”. Moreover, the Zoo from Călăraşi was the largest in the country and was an important animal provider for the other zoos in the country. But out of the blue the revolution came along. As the factory was not entirely finished, the change was not a good one for the people from Călăraşi and in 1998, the Siderurgical Enterprises closed down. In 2001 it went bankrupt and in 2005 it was cut into pieces and sold as scrap iron. When you arrive in Călăraşi from Bucharest, you will find a sad elephant cemetery at the entrance. Silver furnaces still rise up to the sky, but they do not work any more. Now, in many families, only the women work; because the only opportunities open are jobs in textile or sausage factories. In the meantime, men have found for themselves a new preoccupation. Grown-ups, who once were hard workers, drink from dawn till dusk. In Călăraşi there’s a pub at every street corner, so visitors call it “the city of one thousand taverns”. As for the lions from the Zoo, they are bored and lose their fur in insalubrious and narrow cages. A resolute roar hasn’t been heard for a very long time. I went back to Călăraşi the other day, because I wanted to see what remained of “the cleanest city in the country”. I could see a few changes. There are some gas stations and the main street is lined with refrigerators making it hard to walk along. I wanted to see what was happening in the heart of the “2 Moldavians” neighbourhood, how life was for those who were once the fortunate ones. In the back of the “No 2 Hospital”, I found the blocks that were built for the factory workers, who are, at this moment, unemployed or gone to other countries in Europe in search for money. As they have no other preoccupation, people drink on street corners, in hovels arranged in construction site huts, in dens near the blocs, and they also drink in their houses. How much do they drink? Until they can’t drink anymore. That’s the moment when they remember that they don’t have money to pay the rent and they talk lovingly to their wives: “You, wench! Go and f… so that you can pay the rent!” There is resignation on the elders’ faces, they seem to have J-A-I-L written on their foreheads. Their children run around the blocks all day long. They don’t wash and you can see their toes through their shoes. There are some shattered apartments where locals gather around a cassette player and listen to deplorable music. The walls of the blocks are black and you can see smoke coming out of holes in the walls, as it happens when a big fire burns out. But there is no big fire. That’s the way these people heat their flats: with stoves that are put in the centre of the room; because they have no electricity, water, or windows. Despite this, they couldn’t find a better name for the little park in the neighbourhood than “Hope”. While I was listening to the cradles’ sad squeak, a kid with a scraped nose realized that I wasn’t from the neighbourhood and asked “Who are you looking for, mister?” Just like that. Who was I looking for, mister? He didn’t care that I didn’t answer him and continued his commercial examination: “Hey, mister, do you happen to have any money?” I rummaged my pockets and gave him a 50 cent coin. He was amazed by the little coin’s shining and ran to his gang to show them. I followed him to see where he was going and after passing by piles of garbage, I found them. Around five children from the neighbourhood were fishing in a puddle near a dumping cart. They looked at me as if what they were doing the most natural thing in the world. No parents around. And there is one question that is haunting me since then: to whom do these children belong?